The CVRG has three main sources of funding: members’ dues (a major portion of which goes to insurance and the Provincial body), our Annual Banquet and an annual raffle. We really appreciate the fact that our members and the community get behind these important sources of revenue. The raffle usually involves a limited number of tickets providing an excellent opportunity to win your choice of a hunting rifle or a high-end compound bow. The valuable third prize is always an item of use to the outdoorsman. Tickets are available in December and make excellent Christmas presents. The draw is made at the Banquet in February. 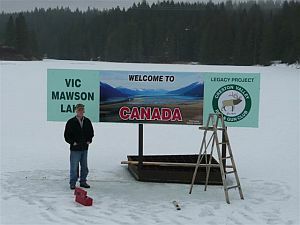 Maintenance and improvement at the Kidd Creek and Mawson Lake properties enjoyed by our members. Support for programmes enjoyed by our members and the community at large: 3-D Archery Shoots, the In-Door Archery Programme, Trap Shooting and Family Fishing Day. Undertaking projects which directly assist local wildlife and their habitat: the provision of winter salt, stream bed restoration, Mallard ‘Hen Houses’ and other nesting projects, and more. Support for other organizations which directly assist the local environment like Ducks Unlimited. Support for local habitat organizations like the Kootenay Wildlife Heritage Fund which purchases properties to protect winter range and ensure access for hunting. Support for our youth and hunter education training by paying the $30.00 Certificate fee for all youths who pass the C.O.R.E. Hunter Education Tests. Support for organizations which support the rights of individuals to own firearms like the NFA (the National Firearms Association). Provide up to two bursaries to deserving members graduating from PCSS.